Art historian, critic, activist, and bon vivant Peter Selz brings immense energy to the world of art. Born in Munich in 1919, Selz immigrated to the United States in 1936, where he has had a stunning career as curator of painting and sculpture at the Museum of Modern Art, founding director of the Berkeley Art Museum, and professor of the history of art at UC Berkeley. UC Press published his pioneering doctoral dissertation, German Expressionist Painting, in 1957, and it is still in print. Among his numerous publications on modern art is his new book, Art of Engagement: Visual Politics in California and Beyond, which will was accompanied by a major exhibition. Did your early personal history inspire your interest in art and politics? In the mid 1930s in Munich, where I grew up, I witnessed the gigantic spectacles that Hitler organized. I visited a precursor to the 1937 Degenerate Art exhibition. Here I saw paintings by Max Beckmann, Ernst Ludwig Kirchner, Paul Klee, and Wassily Kandinsky, all vilified for political reasons, while the artists themselves were persecuted by the regime and had to flee the country. What attracted you to the German Expressionist artists? The artists' adherence to their inner vision, their rejection of traditional bourgeois values, and their creation of an art that demanded participation by the viewer fascinated me. As a doctoral student at the University of Chicago, I decided to write my dissertation on German Expressionist painting. Instead of analyzing the movement in a strictly formalist manner, I realized that it had to be seen in the context of Wilhelminian and Weimar Germany. You co-curated Twelve Artists from the German Democratic Republic in 1989, the year the Berlin Wall came down. Do you believe that art can affect politics? The connection between politics and art is, of course, far from straightforward. Nevertheless, I do not doubt that the artistic and intellectual ferment so evident in the painting and sculpture of the time, as well as in film, theater, and literature, had an impact on the dismantling of the autocratic regime. Not only can artists comment significantly on politics in their work, but political engagement in specific situations can produce authentic art. What inspired you to move to California from New York in 1965? The opportunity to start a new museum at a great university and to teach at UC Berkeley. Also, the free speech and civil rights movements promised a more progressive political climate. In Berkeley I was able to join some of the political actions and to witness the production of art that related quite directly to the broader culture of dissent. With my students, I participated in debates about the culture wars and the interplay between art and life. You have developed close relationships with artists—Nathan Oliveira, Christo, and Jeanne-Claude among many others. How do these friendships affect your understanding of art? My friendships with artists have deepened my understanding of their work. Good art, I believe, is a metaphor for significant human experience. This is what art means to me, why it has importance in our lives. Art of Engagement takes the first comprehensive look at the key role of California's art and artists in politics and culture since 1945. Tracing the remarkably fertile confluence of political agitation and passionately engaged art, Peter Selz leads readers on a journey that begins with the Nazi death camps and moves through the Bay Area's Free Speech Movement of 1964, the birth of Beat and hippie countercultures, the Chicano labor movement in the San Joaquin Valley, the beginning of the Black Panther Party in Oakland, and some of the most radical manifestations of the women's movement, gay liberation, Red Power, and environmental activism. It also deals with artists' responses to critical issues such as censorship and capital punishment. Selz follows California's outpouring of political art into the present with responses to September 11 and the war in Iraq. In the process, Selz considers the work of artists such as Robert Arneson, Hans Burkhardt, Jerome (Caja), Enrique Chagoya, Judy Chicago, Llyn Foulkes, Rupert García, Helen and Newton Harrison, Wally Hedrick, Suzanne Lacy, Hung Liu, Peter Saul, Miriam Schapiro, Allan Sekula, Mark di Suvero, Masami Teraoka, and Carrie Mae Weems. Abundantly illustrated and beautifully produced, Art of Engagement showcases many types of media, including photographs, found objects, drawings and prints, murals, painting, sculpture, ceramics, installations, performance art, and collage. 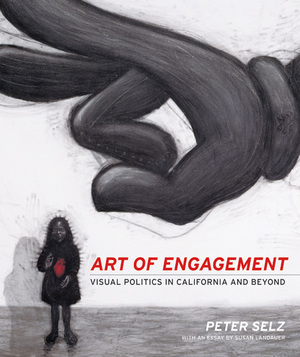 Readers will come away from the book with a historical sense of the significant role California has played in generating political art and also how the state has stimulated politically engaged art throughout the world. Peter Selz is Professor Emeritus of the History of Art at the University of California, Berkeley. Among his many books are Nathan Oliveira (California, 2002), Barbara Chase-Riboud, Sculptor (1999), Beyond the Mainstream (1996), and Art in Our Times (1981). Susan Landauer is Kate and Drew Gibson Chief Curator at the San Jose Museum of Art and the author of many books.